Organisations and individuals interested in making written submissions are invited to do so by Tuesday 10 January 2012. Submissions should be no longer than 2,500 words. Further advice on making a submission can be found below." It is a very wide mandate (perhaps too wide?) but the content of the questions is significant, with a clear focus on some of the key themes in the drug policy and law reform debate raised by the groundbreaking 2002 HASC drugs inquiry, and those that have developed subsequently. So there is a clear focus on the harms of prohibition and the law reform debate - obviously directly reinforced by a number of the other questions. On past experience it's clear the Committee would not be raising these issues if it wasn't genuinely interested in them, and one senses the positive change in the political climate around this debate, in the media, in mainstream politics, in the public, and in Parliament have all laid the foundations for what could, potentially, be a very important piece of work. A note of caution should come from the the last time the Committee tackled the drug issue - 2010's report on cocaine - which was very poor, disappointing on almost every front. It's not clear who is driving this latest move, but it's welcome that it is happening and, as with the previous inquiries, we encourage interested parties to provide evidence, particularly those beyond the usual suspects. The Count the Costs initiative provides a steer as to who they might be. Do contact us for help. The below is reproduced from the Count the Costs blog. 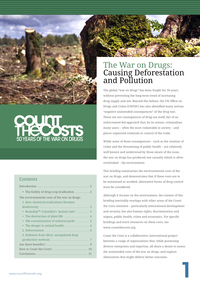 Continuing our engagement with organisations and individuals outside the drug policy sector, we are today pleased to announce the publication of the Count the Costs initiative Environment Briefing. We intend to use the briefing to encourage environmental NGOs – such as Greenpeace, Friends of the Earth and the World Wildlife Fund – to take a public stand on the drugs issue and advocate for reform. And we urge drug policy reformers and those in the environmental movement to use the briefing to encourage campaigns and policy people in green NGOs to engage with drug policy. While some of the consequences of the war on drugs are relatively well known and understood by those aware of the issue, the environmental impacts of current drug policy are seldom given proper consideration. This must change. As this briefing outlines, if these environmental costs are to be minimised or avoided, alternative forms of drug control must be explored. The briefing is available online as a PDF, with print copies available on request. The column below by Transform's head of External Affairs, Danny Kushlick, was published today on thejournal.ie website under the title: Prohibiting drugs hasn’t worked – so why are we still trying? PRESIDENT JUAN MANUEL Santos of Colombia spent two days in London last week. He stated quite categorically that “cocaine is killing my country”, and that cocaine users should refrain because they are contributing to the mayhem in Colombia. This line of argument emerged from a campaign developed in Colombia called Shared Responsibility. His rhetoric is especially interesting because in the Observer he recently called for a debate on the legalisation of cocaine. So what exactly is he saying, and why is it relevant for the people of Ireland? First, let’s be absolutely clear – it is not cocaine, or cocaine use per se that is killing his country. The chaos and violence emerges from the cocaine market prospering under global prohibition. This is what creates the violence surrounding its production and supply; in precisely the same way that the prohibition of alcohol did in the US in the twenties. So Santos finds himself in a double bind: whilst he and his government have been highly critical, they are necessarily political supporters of the global war on drugs, a venture initiated and heavily backed by the US and other key allies. The global prohibition of certain drugs (not alcohol or tobacco of course) for non-medical use came into being with the signing of the United Nations Single Convention on Drugs of 1961. The economics of prohibition means that commodities that are mere plants at the point of production, become worth more than their weight in gold by the time they reach Western consumers. There are now an estimated 250 million illegal drug users worldwide. Tragically and predictably, by the mid 80s, organised criminals, insurgents and paramilitaries the world over had built huge empires on the extraordinary profits (with margins as high as 3,000 per cent) gifted to them by the prohibition. To confuse matters, the war on drugs was now conflated with the war on organised crime. And so the ‘Drug Problem’ was made manifest. Most UN member states (including Colombia) are signatories to the UN Single Convention on Drugs – including the Republic of Ireland. And that is why Mr Santos’s statement about cocaine is of direct relevance to Irish people. The people of Ireland are tacitly supporting the policy that is killing Colombia. But it is not just Colombia. Prohibition – the global war on drugs, is killing many others in Afghanistan, Guinea Bissau and Mexico (where over 40 000 have died in drug related violence since 2006). Ireland is a party to prohibition in principle and in law We are all in this together – it is a shared irresponsibility. A poll earlier this year, commissioned by the European Commission sought the views of young people on drug policy throughout the EU. The highest levels of support for legalisation were from the citizens of Ireland and France, with 21 per cent saying that legalisation is one of the most effective ways of dealing with drugs. There is clearly a mood to change policy and law, and at the very least to begin a debate on alternatives. So, why can’t a genuine, high-level debate begin? Fear and ignorance amongst both voters and politicians clearly underlie much of the stasis holding the current policy in place, but ‘politics’ is at least as important. It is instructive to look at the drug policy trajectory of two world leaders – Barack Obama and David Cameron. Both are former users of illegal drugs and both held reform positions before they reached high office. Once in high office their views apparently shifted to more hawkish, populist positions. The fact is that the long standing system of prohibition has created an environment in which alternative views cannot be tolerated, resulting in the increasingly understood ‘retirement syndrome’, whereby recently retired government officials fall over each other to call for legalisation – freedom from political office allowing them to speak their minds. Irish support for reform is reflected in the work of Paul O’Mahoney’s, The Irish War on Drugs: The Seductive Folly of Prohibition, in the politicking of Independent TD Luke “Ming’’ Flanagan, and the thoughtful policy development of Sinn Fein. In a recent news story, junior health minister Róisín Shortall – who is in charge of Ireland’s drugs strategy – said she had an “open mind” in relation to Portugal’s decriminalisation model. She said she was “particularly interested” in the country’s “yellow card” system, which warns users about their behaviour and tries to steer them away from drugs. However, if Ireland is to free itself from the shackles of a policy developed in a bygone era, one which preceded the sixties drug culture and the widespread normalisation of recreational drug use, it will require politicians to step up to the mark and call for reform. Mr Santos’s position is not completely coherent. He is fighting a war on drugs at the same time as calling for a debate about ending it. However, he has taken a courageous stance in calling for a debate on legalisation and regulation (to understand what this might mean see Transform’s groundbreaking book After the war on drugs – Blueprint for Regulation). He has shown leadership, but undoing the global prohibition will take more than that. In order to transform drug policy into one that is effective, just and humane, UN member states will need to develop a coalition willing to act in concert to challenge the status quo. They will need to call on their peers to Count the Costs of the War on Drugs and explore the alternatives. This is about turning shared responsibility into something more than rhetoric. Putting in place a system of state regulation and control is no panacea. However, Ireland can share the responsibility for global drug control and support President Santos in raising the debate on legalisation and regulation. Remaining silent on the issue at national and international levels is no longer an option for Ireland or for any other UN member state, for whom the status quo means support for the killing of Mr Santos’s country. Danny Kushlick is the head of external affairs at the Transform Drug Policy Foundation. For more information, you can visit Transform’s website, blog, subscribe to their Facebook page or follow them on Twitter. This blog originally appeared on the Count the Costs website. Last Friday 18 November, Transform Drug Policy Foundation, in partnership witha group of major UK drug policy organisations, held a private dinner and discussion for a select group of 30 key NGOs from the development, security, human rights and environment sectors at the Commonwealth Club in London. The high-level event featured presentations by the former president of Brazil and chair of the Global Commission on Drug Policy Henrique Fernando Cardoso (available to view below), the former president of Switzerland Ruth Dreifuss (also of the Global Commission) and Eduardo Medina Mora, Mexican Ambassador to the UK and Mexico's former attorney general. Former president of Brazil calls on NGOs to support Count the Costs from Transform on Vimeo. The event, Time to Count the Costs of the War on Drugs, formed part of our wider Count the Costs initiative and focused on highlighting the devastating impact of the war on drugs on international development and security, human rights, and the environment. Briefings outlining the costs to these first two sectors can be downloaded from the Count the Costs website (development and security here; human rights here), and the environment briefing will be available in the next few days. We were delighted by the high-level representatives who attended our event and the overwhelmingly positive and supportive tone of the evening. While many of the attendees wish at present to remain anonymous, we can confirm that senior representatives from organisations such as Health Poverty Action, Avaaz, Christian Aid, the Institute for Development Studies and Penal Reform International all came to hear about the costs of the war on drugs to their respective fields. In addition, following his attendance at the event, Jonathan Glennie of the Overseas Development Institute wrote an excellent piece in The Guardian mentioning Count the Costs and calling on the development community to engage with the drugs debate. As a result of this event, and the Count the Costs initiative more generally, we're increasingly confident that mainstream, non-drug policy NGOs will become more and more involved in the drugs issue and help advocate for reform. Indeed, Count the Costs is demonstrating to a range of organisations the extent to which their work is being undermined by current drug policy – and why they need to take a stand on it. To see the current list of organisations that endorse the Count the Costs initiative, see the supporters page. And, if you haven’t already, please sign up to the Count the Costs statement. On behalf of Transform Drug Policy Foundation Scotland, we're pleased to announce an upcoming event taking place in Glasgow, on 8 December. The event is being hosted by TDPF Scotland, in association with the Scottish Drugs Forum, Addiction Debates and the Royal Society of Arts. Registration for the event costs £20. To book a place, please email info@tdpfscotland.org.uk, or telephone Mike McCarron on 07833 595 845. Further details, including a full programme of the afternoon's proceedings, can be found in this PDF. This panel discussion will take place on Thursday 17 November at the Centre for Culture, Media and Creative Industries (CMCI), Room 7C, Chesham Building, King's College London, Stand Campus, WC2R 2LS. Emily Crick - MPhil Candidate at Swansea University - "A Brief History of International Drug Laws and the Absence of Gender"
Jane Slater - Operations and Fundraising Manager, Transform Drug Policy Foundation - "Gender: Counting the Costs of the Drug War"
Francesca Tronco Garcia - former member of the United Nations Office for the High Commissioner of Human Rights in Mexico - "Obscurity and Impunity: An Overview of the Gendered Effects of the Militarization Under the Mexican War on Drugs"
For more information, please read the flyer below. "That this House notes the serious harm caused by drugs; recognises the need for evidence-based policy making with a clear focus on prevention and harm-reduction; and calls on the Government to establish an independent panel tasked with carrying out an impact assessment of the Misuse of Drugs Act 1971, reviewing the approach adopted by other countries, and making recommendations for reform." You can follow the list of signatories of this EDM here, and find out more about EDMs here. Transform urges UK supporters to contact your local MP and encourage them to support this EDM (see comments below - this can really help, not least because there are many EDMs and MPs are not always aware of them all). You can also be clear that it is a call for an evidence based policy - not any given policy position, or party position. Transform has been campaigning for an Impact Assessment for a number of years (see here for more information). You can find out more about Impact Assessments by reading this briefing produced by Transform and the International Drug Policy Consortium. We are pleased to copy the media release from Harm Reduction International (below) announcing their important new report published today, on the widespread illegal use of judicial corporal punishment for drug offences. In the landmark study, the non-governmental organisation Harm Reduction International** finds that over forty states apply some type of judicial corporal punishment for drug and alcohol offences. The vast majority of these sentences are handed down in countries such as Malaysia, Singapore, Iran and Saudi Arabia. According to the report, such state-sanctioned violence is in clear violation of international law. The report will be launched today in Kuala Lumpur, Malaysia. The use of caning, flogging, lashing and whipping is in direct violation of international law that prohibits the use of corporal punishment. UN human rights monitors have expressed their concern number of times about the legislation in various countries that allow law enforcement to inflict these types of cruel, inhumane and degrading punishments. Judicial corporal punishment is practiced in countries such as Singapore, Malaysia, Iran, Yemen, Saudi Arabia, Qatar, United Arab Emirates, Libya, Brunei, Darussalam, Maldives, Indonesia (Aceh) and Nigeria (northern states) and many more. 'The use of caning, whipping, lashing and flogging as a sentence for drug or alcohol offences is a clear violation of international human rights law, amounting to cruel inhumane degrading treatment or punishment,‘ said Rick Lines, Executive Director of Harm Reduction International. * ‘Inflicting Harm: Judicial corporal punishment for Drug and Alcohol Offences in Selected Countries’ by Eka Iakobishvili. Published by Harm Reduction International, 2011. ** Harm Reduction International is a leading non-governmental organisation working to promote and expand support for harm reduction worldwide. We work to reduce the negative health, social and human rights impacts of drug use and drug policy – such as the increased vulnerability to HIV and hepatitis infection among people who inject drugs – by promoting evidence-based public health policies and practices, and human rights based approaches to drug policy.